In the years around 1900, “decorative design,” a branch of commercial art inspired by the Arts and Crafts movement and Art Nouveau, provided many talented women artists with a field in which to excel. Most of these artists forged relationships with publishers in either New York or Boston. New Yorker Margaret Armstrong worked primarily for the Manhattan publisher Charles Scribner. Bostonian Sarah Wyman Whitman did most of her best work for Boston publisher Houghton Mifflin Company. Though Hartford had ceased to be a major center for book publishing, a Connecticut woman artist produced a minor masterpiece of book decoration during this period that rivaled those traditionally found in larger cities. In 1894, Houghton Mifflin Company engaged the American impressionist painter Childe Hassam to illustrate a special edition of An Island Garden (a prose work by poet Celia Thaxter) as a Christmas gift book. Such books, with gold- or silver-stamped covers and elaborate decorations, often printed in color. Two years later, to follow up on the success of this lavish publication, Houghton Mifflin issued a second gift book in a similar format. This time the illustrations were by Amelia Watson, a woman artist from East Windsor, Connecticut. 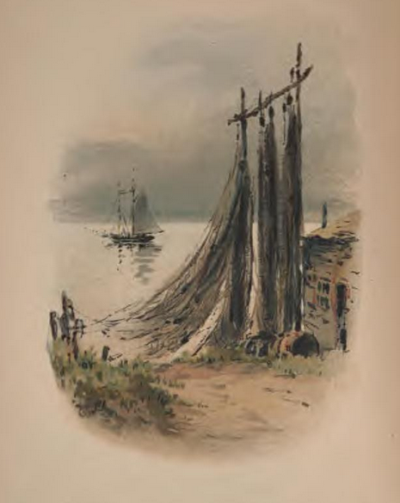 The book Watson illustrated was a New England classic, Cape Cod, by Henry David Thoreau, first published in 1865. Watson made watercolor sketches for the book during a tour of Cape Cod with her close friend, the writer Margaret Warner Morley. She drew directly on a copy of Thoreau’s book, adding decorations to chapter headings, endings, and in the margins. Many amateur artists produced such extra-illustrated volumes, often as keepsakes for friends. Watson gave hers to Margaret Morley. Both Watson’s illustrations and those by Hassam were reproduced as chromolithographs—printed in many different colors to capture the delicacy of the original watercolors. Both books enjoyed great popularity in their day and remain highly prized by collectors. Amelia Watson was born in East Windsor Hill on March 2, 1856, and spent her entire life there. 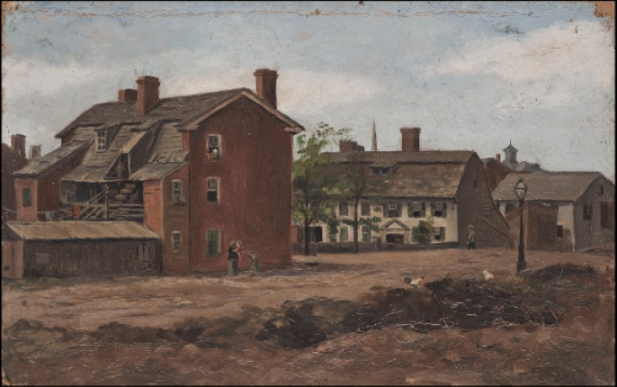 At a time when few women had careers outside the home, she was a successful professional artist, exhibiting and selling her watercolors from the time she was in her early twenties. Her younger sister, Edith, was a successful professional photographer, whose photographs appeared in books and magazines. Both women lived independent lives and traveled widely—Edith primarily to Canada, Amelia to the American South. Watson was an active figure in artistic and cultural circles in Hartford and in Boston, where she was a member of the Boston Art Club. From 1878 to 1902, she taught art at the Martha’s Vineyard Summer School. She was also one of the first teachers at the Hartford Art School, where she taught “decorative design” and encouraged other women to pursue the study of art. While Watson was not primarily a book artist, her book decorations are among her most enduring works. In addition to Cape Cod, she contributed a cover design and frontispiece to The Carolina Mountains, a book by her companion Margaret Morley that Houghton Mifflin published in 1913. In 1916, a drawing by Watson appeared as the cover design for A Thousand Mile Walk to the Gulf by John Muir, also published by Houghton Mifflin. Amelia Watson died in Florida in 1934; her sister Edith died in 1943. Both sisters are buried in the cemetery in East Windsor Hill. The Wood Memorial Library in South Windsor has a collection of their works. Additional watercolors by Amelia Watson are also in the Connecticut State Library, the Stowe-Day Library in Hartford, and the Martha’s Vineyard Museum in Edgartown, Massachusetts. “Amelia Watson’s Sketches for Thoreau’s Cape Cod (1896).” The Walden Woods Project, 2017. Link. “Connecticut State Library,” 2017. Link. “Museum Collections.” The Wood Memorial Library & Museum, 2017. Link. “Stowe-Day Library.” Harriet Beecher Stowe Center, 2017. Link. Hough, Henry Beetle. “Amelia Watson.” The Dukes County Intelligencer, February 1968. Link. “Watson, Amelia Montague, 1856-1934.” UCONN, Connecticut Digital Archive, 2017. Link. Finlay, Nancy. Artists of the Book in Boston, 1890-1910. Cambridge, MA: The Houghton Library, 1985. Rooney, Frances. Working Light: The Wandering Life of Photographer Edith S. Watson. Ottawa, CA: Carleton University Press, 1996.